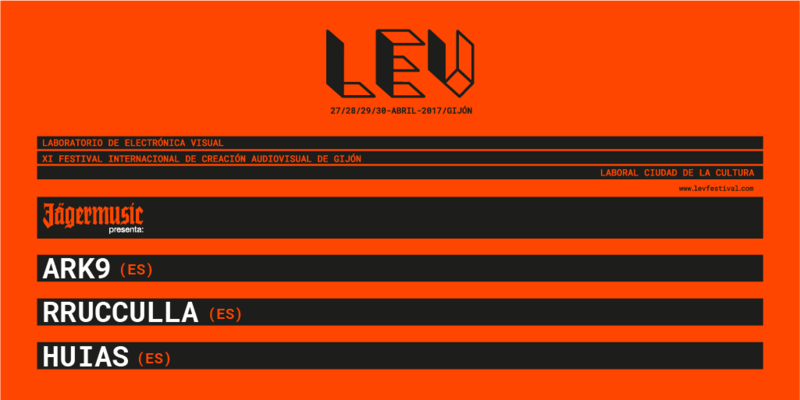 L.E.V., a project co-produced by the Government of the Principality of Asturias, Gijón’s Town Council, LABoral Centro de Arte and Datatrón Collective, keeps on searching the evolution of new audiovisual languages. 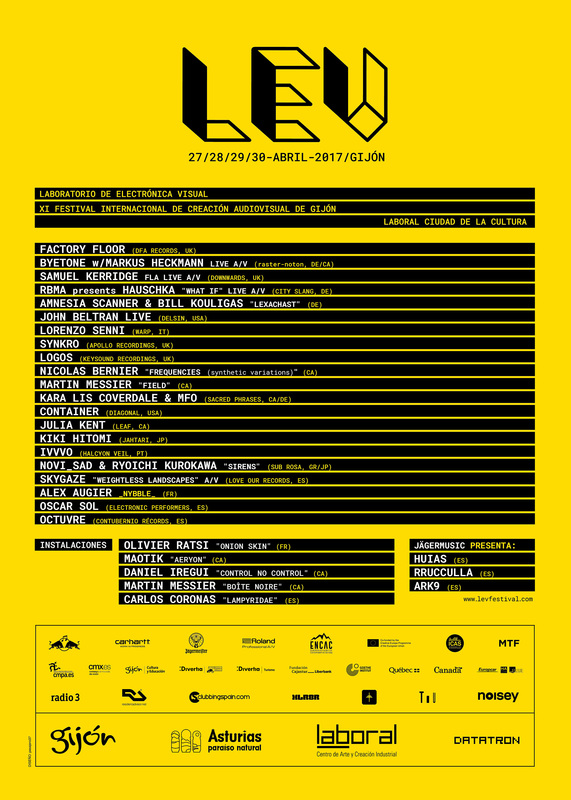 From April 27 to 30, the Festival will feature a lineup full of daring and innovative international acts that aim to go beyond classic formats within the fields of sound and vision creations. After announcing its activity lineup, L.E.V. Festival adds some last events: Geometría del Esplendor: a documentary film about industrial music legends Esplendor Geométrico, a Jägermusic showcase dedicated to support new Spanish musical talents, a live presentation by Octuvre, the new solo project by Juan Casamayor (Suit Tiger), a collaboration between visual artist Oscar Sol with Logos and John Beltran, and the Closing Party at Gijón’s Club Lanna with Rob Hall and Komatssu. Geometría del Esplendor is a documentary on the legendary band known as Esplendor Geométrico. This film captures more than thirty years of music, creativity and independence during the revolution of techno music. It takes you back to the times and to the foundation of the art that still lives on today throughout Spain and Europe. The style is described in a metromatic decalogue or key combination, among other things, are laid out using structures of guidance, like a symphony, different assembly order and set combinations of random appearances, like music models and interviews, but are well put together. Screening of this documentary film, with a presentation by director José Ramón Da Cruz at Laboral Cineteca. For the second year around, this collaboration between Jägermeister and L.E.V. Festival brings us a Jägermusic showcase dedicated to support new Spanish musical talents. This year’s lineup is formed by RRUCCULLA and Huias, representing Jägermeister’s musical programme, and ARK9, chosen by the Festival. On the showcase that will take place next Saturday April 29, young Bilbao artist RRUCCULLA will delight us with her combination of future jazz and electronica; HUIAS, with headquarters in Gijón and old friends of the Festival, will go on exploring the connection between the pop universe and avant-garde electronics; finally, ARK9 will provide their unique noisy synth-pop vision. Octuvre is the solo project by Juan Casamayor (Suit Tiger), who has recently released his first solo album Distancias, combining analogue synth electronica, rhythm sequencers, dark melodies and love and fatalism as central themes. His music evokes the industrial environment where Octuvre was born, among centennial mines and factories still in use. Oscar Sol is an artist specialized in generative visuals in real time and the interaction technologies applied to scenic arts. His visual sessions, which boast a distinct digital aesthetic and an elaborated synchrony with sound, are based in geometrical abstractions and the use of more figurative three-dimensional models, which he combines in evocative, futuristicl andscapes that get him closer to live cinema. A very important part of his process and creative discourse is to represent visually the qualities of sound, and integrating them as an invigorating element of his work. This time, sound creations by Logos and John Beltran will be used as the basis for Sol’s visual representations, a collaboration curated by the Festival especially for this event. On Sunday April 30, L.E.V. will celebrate its Closing Party with the collaboration of Club Lanna, to finish this new edition of the Festival. The party will feature legendary Dj Rob Hall and the indefatigable Komatssu. Rob Hall belongs to Gescom platform, a very influential collective also integrated by, Autechre (Rob Hall is their official tour DJ), among others. Hall has also worked with the prestigious Skam label, with a roster that includes such renowned artists as Bola or Boards of Canada. Active since 2007, Komatssu is the most personal project by Hector Sandoval (Tensal and 50% of renowned techno project Exium). A project based on the natural fusion of the most melodic IDM and ghostly avant-techno, conceiving sound as a catalyst of emotions in order to create a truly personal landscape. Both in his live shows and Dj sessions, Sandoval explores the different structures and sound intensities that exist around IDM, electro and avant-techno, also leaving space for more ambient moments. After his last releases on Editions Mego and Barcelonian label Sin Hilo, Sandoval is working on a new album where he will explore the limits of his hard drive, referencing his works during the last ten years. A journey through the limits of time, the new technological breakthroughs and the different textures that can be used to dress up emotions. Limited capacity show that requires an exclusive ticket. Daytime tickets for Friday and Saturday activities will be available this week, as well as “Night only” tickets. Tickets will also be sold for specific, limited capacity shows such as the screening of Geometría del Esplendor documentary film, Julia Kent’s live show at the Botanic Garden or our Closing Party at Lanna Club, both scheduled for Sunday April 30. Jägermusic presents: Huias (Sonido Muchacho, Sp), RRUCCULLA and Ark9.